If you’ve been reading the blog for a while, you know I’m head over heels in love with stuffing last night’s leftovers into freshly baked sweet potatoes. Heck! I love stuffing them into microwaved sweet potatoes too! Whatever time permits, really. It may be common to load these outrageously orange spuds up with brown sugar and marshmallows but let me tell ya, savory sweet potatoes are beyond delicious! It’s gotten to the point where I will basically never go back to sweet sweet potatoes ever again. I KNOW! Super bold statement; but it’s 110% true! Ready to try something new? Here are a few of my favorite sweet + savory combos! Aiming to eat more veggies? Load up on the good stuff by topping baked sweet potatoes with all your favorite taco ingredients. Bonus points for sneaking veggies into the taco filling too! Serve up a twist on the classic broccoli and cheddar potato by swapping the typical russet potato for a sweet potato. You can keep things simple by topping a baked (or microwaved!) sweet potato with steamed broccoli and cheese and melting it in the microwave just before serving, or you can take a little extra time to whisk together a dip-worthy cheese sauce to pour over your broccoli potato. Anything goes! Spinach, Arugula, and even sautéed kale are positively delicious paired with sweet potato. Add a little cheese to the mix (feta or gouda are favorites here!) or try them with black beans and guacamole. Past favorites of mine include these stuffed sweet potatoes with feta and arugula and cheesy kale stuffed sweet potatoes with garlic and havarti. These are one of my favorite lunches! Inspired by one of my favorite restaurants in college, these sassified spuds are stuffed to the brim with all your favorite sandwich ingredients. I used to make them with russets but have since switched to sweet potatoes. My favorite combo is turkey, spinach, cheese, and tomato with a sprinkling of green onion on top. SO GOOD! 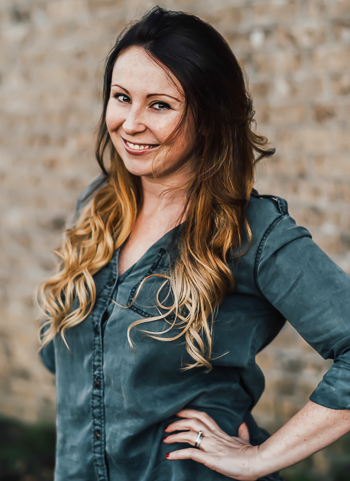 In fact, one of my first blog posts was about this ultra easy meal idea! Check it out in all it’s embarrassing glory here. Ooh! AND as another twist on our sandwich sweet potato theme, they’re also super amazing with a crumbled veggie burger on top. I add all my favorite burger toppings and condiments and it’s positively delicious! Grab some Frank’s Red Hot and meet me in the kitchen! 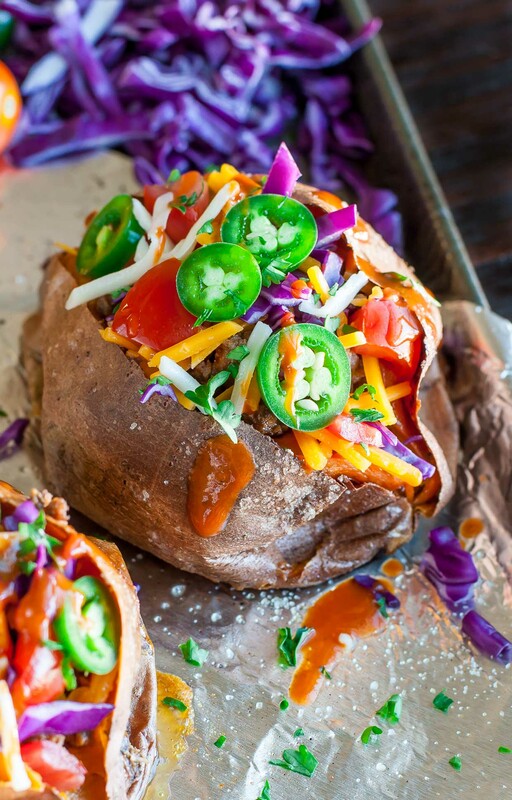 Top these spicy spuds with shredded chicken, bell peppers, jalapeño, cheese, and a hearty drizzle of buffalo sauce. They’re kind of like my buffalo bell peppers or buffalo chicken spaghetti squash but with a gorgeous orange sweet potato instead. Yes! Need a recipe? 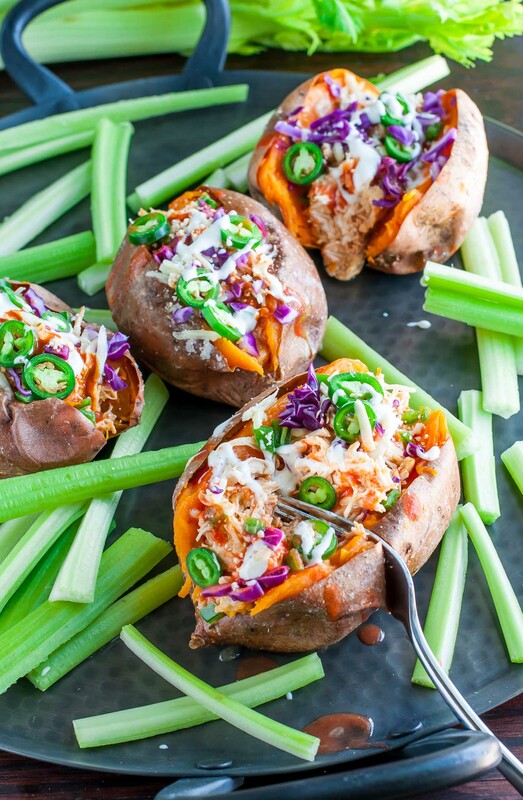 Snag the instructions for these Buffalo Chicken Stuffed Sweet Potatoes here. I have this super addictive Cranberry Quinoa Salad I like to make and top with candied walnuts (which you can make in like, 5 minutes! Score!) 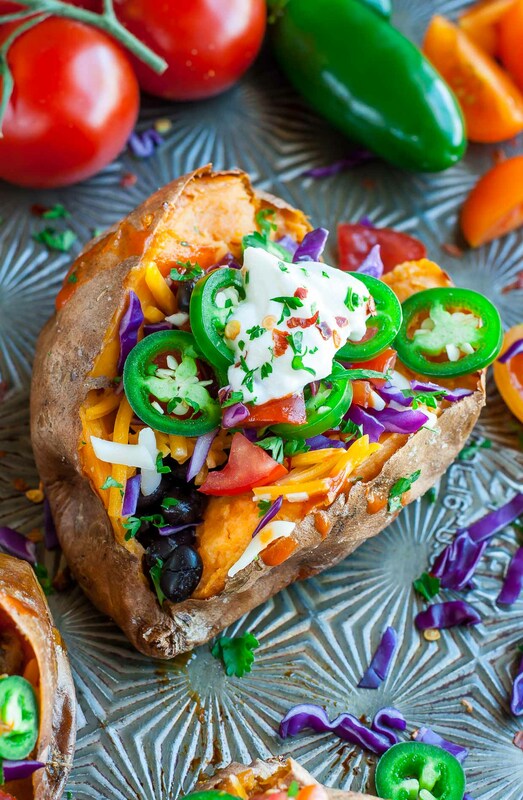 and, as luck would have it, it’s incredibly tasty when stuffed into a sweet potato too! Another tasty option would be to roast fresh cranberries for 10-15 minutes at 400 degrees F. Remove from the oven and, while still hot, add them to a freshly cooked sweet potato. Top with a drizzle of honey, a sprinkle of cinnamon (or cinnamon sugar) and crumbled feta. The results are super similar to this recipe. You can even add some roasted/toasted pecans or walnuts for a crunch! 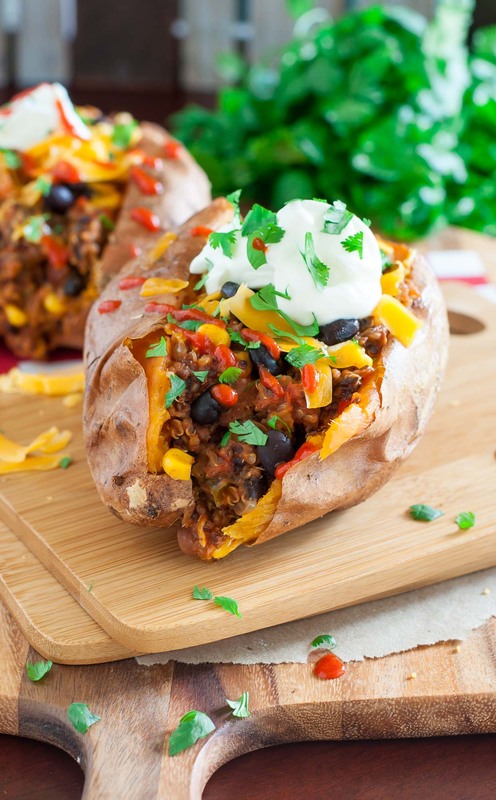 It’s time you tried a breakfast baked potato! It’s easy! 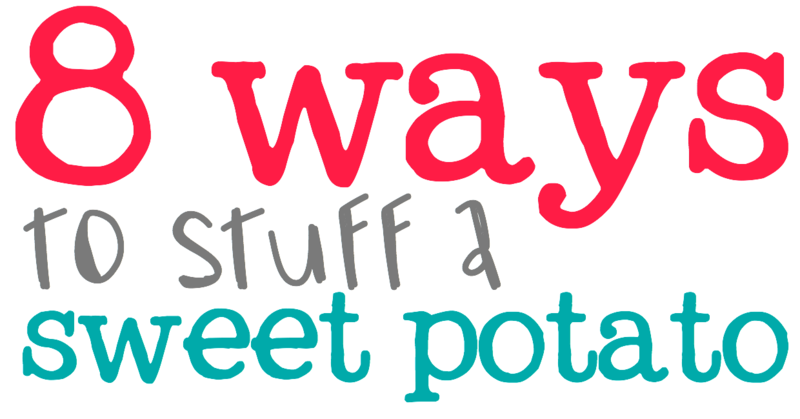 Simply stuff a sweet potato like you would a fluffy omelette (complete with scrambled or a fried egg on top!) and brunch like a champion. These are great any time of day and can be an awesome way to empty your crisper drawer too. Load ’em up with veggies or go the bacon egg and cheese route if you dare. 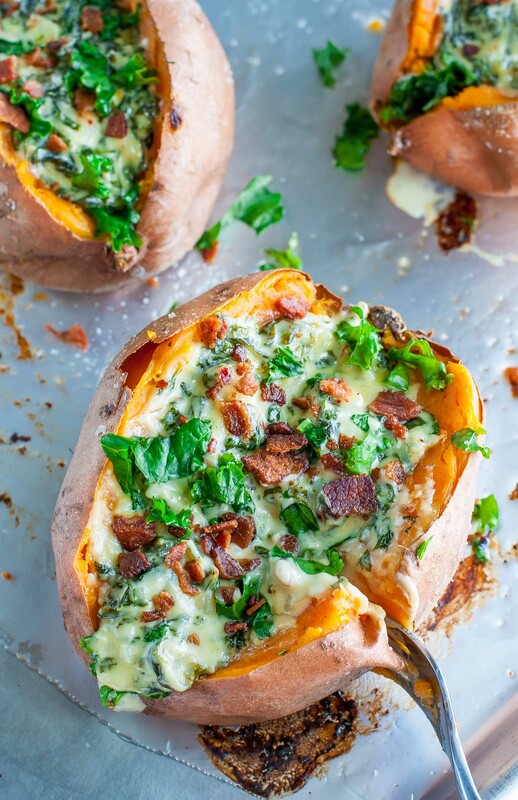 Breathe new life into last nights dinner and stuff it in a sweet potato! Thanks Char — Team savory FTW! I need more kale 😉 Haha I am perpetually running out!